Danyell Jones is the UX Research Lead at ZS Associates where she oversees and conducts research across 5 different verticals in the Software Development group. They work with teams that develop software applications to support pharmaceutical clients. Danyell works with teams to develop reusable and efficient processes for conducting and analyzing research while increasing the visibility of the research practice and user experience team. Previously, Danyell established and led the research practice at Relativity, a software firm in Chicago, where they conducted user research to support teams with data-driven product development. 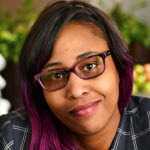 In addition to working in user research, Danyell teaches graduate-level classes in the HCI program at DePaul University as well as at the Illinois Institute of Art in the Web Design and Interactive Media department. She is also a runner, an avid reader, a Whovian, and a video game lover.